After former Chanco Lodge Chief Ben Vincent supplied me with over 70 scanned copies of the Chanco Courier newsletter spanning over 4 decades, he decided to continue his contributions by filling in the needs of Old Dominion Area Council camp patches. 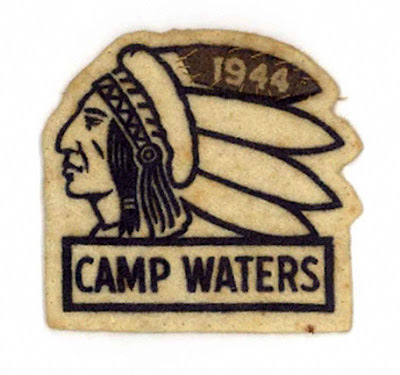 I am in the process of adding the pictures to this web site, and began this evening with a picture of a white Camp Waters felt patch with a single brown feather stitched on to indicate the year it was earned: 1944. Previously I had a photo of the white felt Camp Waters Indian profile patch with feathers for the years 1947, 1948, and 1949, so it was interesting to learn the same patch was used for at least 5 years for campers who spent part of their summers at this camp which served Old Dominion Area Council from 1928 to 1966. The camp was physically located on a bluff overlooking the James River, almost directly across from Jamestown, and was named after Col. Francis E. Waters, president of Surry Lumber Company, which donated the 30 acres for the camp site. For more details about Camp Waters on the James including a map of the property, be sure to read The Chanco Chronicles 1952-1992.